Age limit: Candidates born between 13 January 1998 to 02 January 2002 can attend this rally recruitment. Date of birth block: Candidates who are born between 13 January 1998 and 02 January 2002 are illegible to appear in rally recruitment. Educational Qualification: 10+2 examination with Physics, Chemistry, Biology and English. Districts to be covered:- Akola, Amravati, Bhandara, Buldhana, Dhule, Gadchiroli, Gondia, Hingoli, Jalgaon, Jalna, Latur, Nagpur, Nanded, Nandurbar, Osmanabad, Palghar, Parbhani, Raigarh, Ratnagiri, Sindhudurg, Wardha, Washim & Yeotmal districts of state of Maharashtra. Notification of Rally recruitment for the districts of Tamilanadu State. Starting from 09 October to 14 October 2017 for Group "X" technical trade. Venue: Voorhees College, Vellore, Tamilnadu. 13 October 2017 Physical Fitness Test (PFT) and Nilgiris and Perambalur districts of Tamil Nadu. The Indian Air Force Invites Indian candidates to appear in recruitment rally program conducted at Rajkot and Vadodra, Jujarat state. This recruitment Bharti will be conducted from 11 Sep 2017 to 13 Sep 2017 at VIR Savarkar Indoor sports stadium, Race course Road. The Recruitment at Vadodra will be conducted from 19 Sep 2017 to 21 Sep 2017 at Sama Indor Stadium, New Sama, Vadodra, Gujarat. Venue :- Indoor Stadium, Near Budha table, Raipur, Chhattisgarh. Air Force Direct Rally Recruitment Barakpore, West Bengal 2017. Candidates can join as Airman from state of West Bengal and Sikkim. This recruitment for Group Y (Non-Technical), Automobile technical, Ground Training Instructor, IAF Police and Medical Assistant pnly. Districts to be covered :- 24 Paragnas (N), 24 Paragnas (S) & Kolkata, Murshidabad, Malda, Cooch Behar, Jalpaiguri, Darjiling & Dinajpur, East Midnapur, Purulia, North Dinajpur, Hoogly & Alipurduar districts of State of West Bengal and all districts of State of Sikkim. Kerala and UT of Puduchery Rally Recruitment 2017 Indian Air Force. 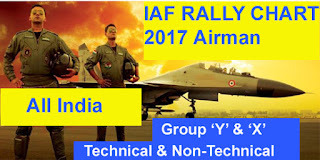 Indian Air Force (Bhartiya Vayu Sena) Rally Bharti Recruitment from 25 May 2017 to 30 May 2017. Vanue : SKMJ Higher Secondary School, Kalpetta, Wayanand, Kerala. Registration Schedule :- Candidates who are eligibility and want to join Indian Air Force must report to the registration place along with duly filled registration form with two recent passport sized photograph and original documents. Registration Vanue :- 14 Asirman Selection Centre, VII/302-B,Vayusena Road, Kakkanad, Kochi –682030, Kerala. Written test ant PFT of Wayanad, Kozhikode, Kasargod, Kannur & Malappuram districts of state of Kerala and Mahe district of UT of Puducherry. 27 May 2017 : Reserve Day. district of UT of Puducherry. approved by Central / State Education Boards with minimum 50% marks in aggregate and 50% marks in English. minimum of 50% marks in aggregate and 50% marks in English. Vanue : Hasanamba Indoor Stadium (Near Akashvani), Salagme Road, Hassan, Karnataka. 1 Group Y Non-Technical and Security trades Airman Selection rally bharti at Jawaharlal Nehru International stadium, Kaloor and 14 Airman selection centre, Kochi. The rally will be start from 21 November 2016 to 25 November 2016. 21 to 22 November 2016 : - Ernakulam, Thrissur, Alappuzha, Kollam, Kottayam, Idukki, Pathanamthitta districts of State of Kerala and UT of Lakshadweep. 25 November 2016:- This is reserved day. Eligibility Criteria for Airman Selection in Indian Air force. Age limit:- Applicant born between 08 Jan. 1997 to 28 June 2000 are eligible to appear in the Rally bharti Kochi. Note - 1: Boards recognized/affiliated by Council of Boards for School Education (COBSE) will only be permitted. Note - 2: Exact aggregate % of marks before decimal as written in the marks sheet of 10+2/Intermediate/Equivalent OR calculated as per the rules of concerned Education Board will only be considered (For example 49.99% should be taken as 49% and not to be rounded off to 50%).